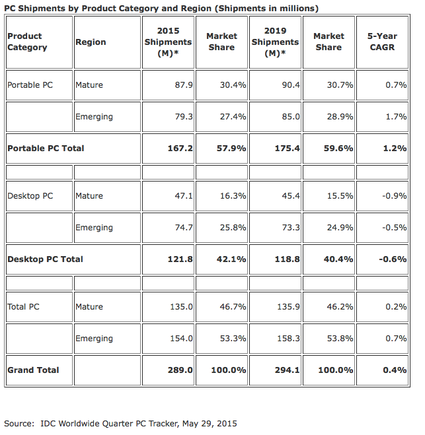 Worldwide PC shipments are expected to fall by 6.2 per cent in 2015, representing the fourth consecutive year of declining volume as the PC market continues to struggle with competition from tablets and smartphones and generally low demand. According to IDC, the market almost saw stable shipments in mid-2014 as the end of support for Windows XP boosted demand for replacements, but that cycle has passed and been replaced by a reduction in inventory on the supply side as the market awaits the arrival of Windows 10 this summer. Going forward, IDC believes that Windows 10 “should be a significant contributor” to the PC market - providing an upgrade path from Windows 7 for commercial users and a range of features boosting convenience and integrating the user experience across platforms. Nevertheless, changes like the free upgrade option for consumers and platform integration aren't expected to drive a surge in new PC shipments. Consequently, the commercial segment is expected to evaluate the OS before deploying it and most new commercial PCs will be replacement systems. The consumer transition to Windows 10 should happen quickly, but the free upgrade reduces the need for a new PC and IDC expects many consumers will continue to prioritise spending on phones, tablets, and wearable devices like the Apple Watch during the holiday season. “Microsoft and PC vendors still need to convince users of the advantages of the new OS and new PCs, which will take some time,” says Loren Loverde, Vice President, Worldwide PC Trackers. “In addition to educating clients, they'll face tough competition from other devices, and weak spending in many regions. Read more What’s driving global smartphone growth? Loverde believes the impact of competing products, as well as the strong US dollar and weak commodity prices have also constrained spending - particularly abroad. This has especially affected the consumer segment, while commercial demand remains stronger in both mature and emerging regions.